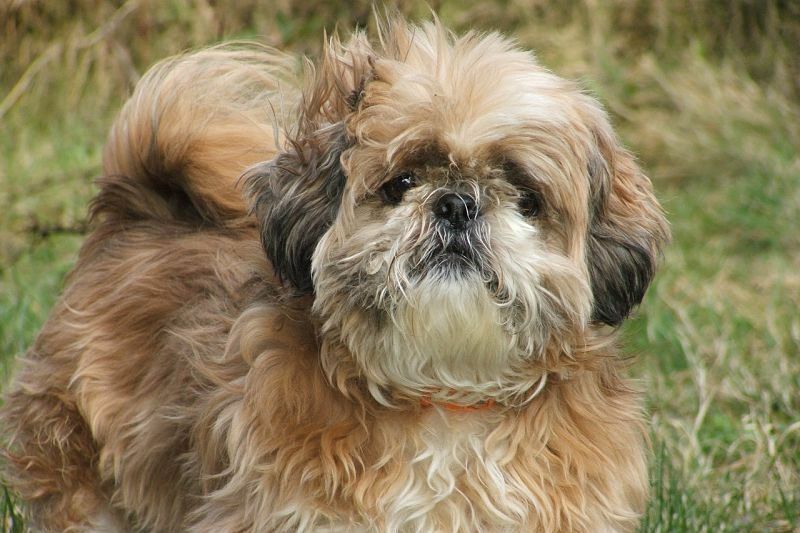 The Shih Tzu’s ancestry is unique: it originates in Tibet, where lamas bred these dogs to resemble small lions. According to the AKC, it is the twentieth most popular breed in the world, and after one look at this adorable toy dog, it’s not hard to see why. The Shih Tzu weighs only ten to nineteen pounds and stands on average ten inches high. The small size and easy demeanor makes this a perfect small dog for apartment living. Bred for the sole purpose of companionship, the Shih Tzu is a perfect friend and lap dog. It enjoys meeting new animals and new people, and it is most happy at home with its owners. Due to its delicate nature, it does not do well outside, especially in extreme temperatures, and must be kept inside and allowed to sleep inside. Additionally, the owner should monitor it whenever it is outside for signs of heat exhaustion. However, the Shih Tzu’s appeal spans more than just its looks. Their small size makes them perfect apartment dwellers, and they only require a short walk each day, or could make do once in awhile with a zoom around their rooms and under your feet. This breed is playful and sometimes mischievous. They don’t have the same intensity of other toy breeds and will happily partake in any activity you do, including snoozing on the couch, watching TV, brisk walks outside, play dates with other dogs, or sitting by and watching as you cook or organize your closet. Additionally, this breed does not always have the same separation anxiety as other toy breeds, and if left alone for a few hours, should peacefully play with toys or run around the house until you return. And when you do, you will be greeted with your dog’s sweet, funny smile: all Shih Tzus have underbites! They have a long, shaggy or silky double coat which comes in many different colors. In show Shih Tzus, it is common for owners to allow their fur to grow long and trim it until it skims the ground, which is an interesting and beautiful cut. However, most owners prefer to keep their hair shorter which minimizes tangles. Their beautiful coat, regardless of its length, requires daily brushing and regular and frequent grooming. The Shih Tzu’s tufted tail is carried curled over its back like many of its cousins, including the Papillion. Owners may need to purchase scissors or electric clippers to maintain the easier, shorter “puppy cut” to mitigate tangled fur, but the easiest method would be to allow a groomer to trim your dog’s coat. Be sure to comb out any tangles before a bath, as the water will tighten these tangles and make them nearly impossible to remove. Shih Tzus also have a distinctive topknot on their heads, which can be cut or tied into a small bun with a tie made specifically for hair or fur. Rubber bands will break their fur and most likely cause your dog pain when they are removed, so they should be shunned in favor of more responsible options. Although their coat is relatively-shed free, they are not a perfectly hypoallergenic breed. Additionally, when they are about one year old, they go through an intense shedding phase for about three weeks that may startle a new owner, but this is typical and should taper off naturally as they grow their adult coat. The average Shih Tzus lifespan is approximately ten to sixteen years, although this time may not be free from health conditions. Their small size may manifest itself in different health issues, including dental complications, dislocated kneecaps, and respiratory problems. They may also be prone to obesity. If buying a dog from a breeder, its lines should be checked for kidney function and eye issues, and a breeder worth their salt will have certifications for both of these and more. Additionally, while adopting an adult Shih Tzu from a shelter may not ensure that they will not have these issues, you will at least be able to prepare yourself by knowing if they do, as these should manifest before adulthood. Wherever you source your Shih Tzu, you will be welcoming a perky lap dog who will bring lots of smiles to your life as you groom and play with your dog.